Worm+Farms+Florida,Worm Farms In Florida,Florida Worm Farms. One Half pound Florida Composting Red Wiggler Worms with micobic starter media mixed without chlorinated water is $25.00. One pound of Florida Composting Red Wiggler Worms with micobic starter media mixed without chlorinated water for $49.99. Thanks you for your interest in Florida Red Worms. We are a Company that specializing in a native Red worms to the U.S. Vermicomposting with native Red Worms is a safe composting approach. Red Worms are great for turning your food left overs into compost. We Sell by size of Red worm,which are large. On the average is 450 Red worms to a pound. The reason why we don’t ship by thousands or use this term is because it can be confusing. To explain, a thousand grains of sand is one thing, or a pound of sand is a something else.When ordering Red worms by the thousand expect worm size to be smaller than a needle. Selling large Red worms which are like a chicken ready to lay eggs and stress less. Our Red Worm Farm Started in 1965. Any question call 813 770 4794 $49.99 per pound . In Tampa Hongkongwillie Red worm Farm sells a Native Red Worm to Florida. This worm is is part of a solution for eliminating part of your waste going to landfills around Tampa. Vermicomposting is the process of using worms and micro-organisms to turn kitchen waste into a black, earthy-smelling, nutrient-rich humus. This possess is a inexpensive way to compost and in return organic matter into rich soil. People in Tampa interested in composting have visited Hongkongwillie Red worm Farm for over 30 years. Hong Kong Willie Red worm Farm in Tampa started in 1965,from Hongkongwillie living on a landfill as a child in Tampa on Gunn Hwy. This making a large impact on his life. Composting with Red worms can reduce a large amount of our waste that go to Landfills.Studies have shown that invasive worms (Eisenia foetida, or”European Night crawlers). Their voracious appetites and reproductive rates (Eisenia foetida, or”European Night crawlers) have been known to upset the delicate balance of the hardwood forests by consuming the leaf litter too quickly. cause natural impact on the environment. Florida Worm Farms,Florida+Worm+Farms,Worm Farms in Florida. Red Worms Florida Google Map HongkongwillieLettuce Lake, the only open spot in the river, gave us a look at the county park tower where folks so inclined can view the swamp without getting their feet wet. And a little further up, we found the buzzards. 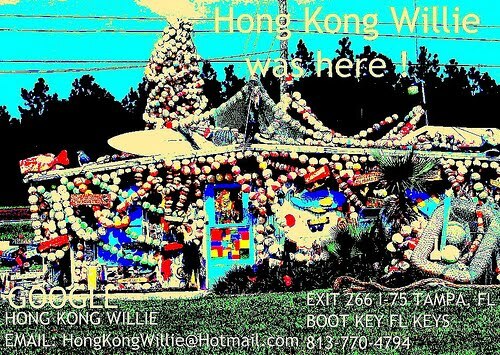 Look for Hong Kong Willie on Yahoo And Bing.